Syllabus of the Online Course (Subject): African Leadership in the History of Humanity. Cradle of Humanity. Africa: The Cradle and the Future of Humanity. NOTE: This subject is based on the article “The Leadership of Africa in the history of humanity” by Pedro Nonell. You can Download the article “Africa - The Cradle of humanity” (PDF). Learning materials in or Afrique Berceau Humanité Africa Cuna Humanidad Africa Berco Humanidade. 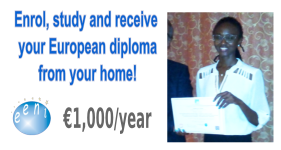 Description of the Online Course: Africa in the history of humanity. Introduction. Africa: The Cradle of humanity. From 6 million years ago, the most extraordinary steps, three authentic revolutions of humanity, have occurred in Africa to become who we are, the Homo Sapiens. Only, for this reason, Africa should be the protagonist in the history of humanity. Climate change has been a key factor. In this article is synthesised the long history of our origins and its relationship with Africa. Important note. The information presented in this paper, may not be accepted or may be can generate discomfort in some readers, perhaps in some Christians or Muslims, thinking that is not compatible with the Bible or the Quran. In any case, the objective is not to go against principles of these or other higher religions, but to show scientific information that allows us better to understand the fundamental role of Africa in the history of mankind. If any reader believes that this article goes against their religious principles; we apologise in advance and humbly suggest that he/she firmly maintains its religious positions, and to read this information only from a scientific point of view. A very brief history of the evolution. Homo Sapiens, we, the humanity belongs to the group of primates, along with 180 other species. This does not mean that we descend from current monkey species, but the other species that have disappeared. It is estimated that the separation of the evolutionary line of Chimpanzee took place between 4.5 and 7 M.Y. (millions of years ago). Human beings, along with orangutans, gorillas, and chimpanzees, are “Hominids (Hominidae).” This family of primates includes four genera and seven living species. Humans and anthropomorphic belongs to the group of hominoids. 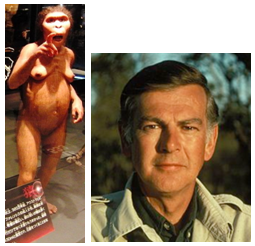 All humans, the current Homo Sapiens, has an African origin, like chimpanzees and gorillas. First African revolution: The first hominid (Proconsul). According to actual available data, the first hominid, called Proconsul, appeared in East Africa, in the Great Lakes region, in the Miocene (between 24 and 5 M.Y. Ago). Fossils of Morotopithecus, Afropithecus and Kenyaphitecus (between 23 and 14 M.Y. Ago) have been found in this region. If one accepts that the Earth has an age of 4,540 million years, the period from the emergence of Proconsul (24 million years ago) to the present is nearly insignificant. However, this period is almost inconceivable in human terms. It is estimated that about 17 M.Y. Ago, when the Arabian Peninsula and Africa were united, these hominids began the first colonisation of the world, expanding by Eurasia, emerging new genera and species. Almost all of them disappeared between 8 and 7 MY, mainly by geo-climatic reasons, appearing new species. Fossils of Ardiphitecus Ramidus (4.4 MY) have been found; probably they walked upright; they were bipedal. Is the time of the Australopithecus Amarensis (Australopithecus translation would be “the Southern ape”), and we have the certainty that he was bipedal. Skeleton and restoration model of Lucy (Australopithecus). Exhibit in the National Museum of Nature and Science, Tokyo, Japan. To the right, Donald Johanson. Also, the so-called “footprints of Laetoli” were found, so it is deduced that they walked in a similar way to us. It is estimated that his intelligence would be equivalent to a current chimpanzee. Afarensis moved toward West Africa. In 1995, the fossils of a new species were found in Chad: The Australopithecus Bahrelghazali (3 M.Y). In 1924 in South Africa, were found the remains of a new species: The Australopithecus Africanus (2 and 3 MY). As we have seen, Africa, in particular, East Africa (Ethiopia, Kenya, and Tanzania) has been the main region where this evolution took place. This East African origin has been called the “East Side Story” by Ives Coppens. This important step to bimetallism will bring advantages to the australopithecines: the release of hands, access to new ecological niches, stability, modification of the centre of gravity (saving of the energy in movements), higher strength, and better regulation of body temperature (receives less solar radiation). About 2.5 M.Y. These hominids were diversified into two evolution lines: The Paranthropus (characterised by a strong chewing apparatus, disappeared around 1 M.Y. Ago) and the first Homos. In 1758, Charles Linnaeus named the human race with the term Homo. Today; it is accepted that the oldest remains of this genus are found by Donald Johanson in 1994 at Hadar (Ethiopia), with an antiquity of about 2.3 MY. Besides this fossil, several stone tools (called Oldowan or mode 1) has been found, an essential condition of this second revolution. Carl Linnaeus. Stone tool (Oldowan). To carve a stone for a particular purpose involves planning. It also implies to have other tools to aid in the production. Thus, they could begin cutting, and the access to meat was increasingly simpler, this increased protein consumption, favoured the brain growth (consumes 20% of the energy of the body). We know that the brain structure of these homos was similar to ours. The increase of the brain (doubled) difficult births. Women had to be helped. The newborn was born more unprotected, more and more dependent on his mother and the group for his survival. This brain increase, particularly the cortex, made it possible to develop better social relationships within the groups; the “social intelligence” was born (Dunbar and Aiello). Surely, although not all scholars share this opinion, also appeared the first forms of languages. Sexual dimorphism (the difference between the size of the man and woman) was reduced. Its height should be similar to ours. Later, these early homos also colonised Eurasia. Homo Rudolfensis (1.9 y 1.6 M.Y.). Summary table of the Evolution of Humanity in Africa -2nd part- (Source: Juan Carlos Sastre). 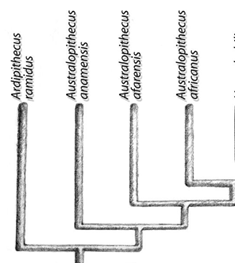 It also should be noted that other scholars do not distinguish between Habilis and Rudolfensis. As we can see these three species of Homo coexisted in time and space. Homo Ergaster, has the largest brain than Rudolfensis and Habilis, the molars were reduced, and the nose is more prominent. The most famous fossil was discovered again by Richard Leakey in 1984 near the Lake Turkana (Kenya), therefore called the Turkana Boy; it is estimated that he has 1.5 M.Y. It is the better skeleton found of a hominid; it is estimated that he should measure 1.60 metres, so it is believed that he would measure 1.80 (adult). Also, fossils of Homo Ergaster were found in Southern Africa. 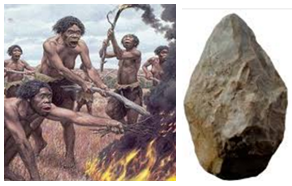 Homo Ergaster invents a new way to carve the stones; the Acheulean or Mode 2, a much more advanced industry. Ergaster invents the first bicephalic tools (two-sided): axes and picks. With them, he can do many new things, perhaps even tanning leather. As in the past, the three species disappeared. As we have seen the first two revolutions, from Proconsul to Homo Ergaster, has been fully realised in Africa. Homo erectus - The colonisation of Asia. In 1891, the Dutch physician Eugene Dubois discovered fossils on the island of Java - Indonesia- (between 1.8 - 1.6 M.Y); in other words, at the same time as Homo Ergaster. Scholarships have deduced that while both species have common features; they also have differentiated, and thus they created a new species: Homo Erectus, almost certainly derived from Homo Ergaster. In China, especially in the cave of Zhoukoudian, near Beijing, also have been found fossils that have been assigned to Homo Erectus. Homo Erectus had a cranial capacity between 915 cc and 1225 cc, greater than Homo Ergaster. Homo erectus lived in Asia until Homo Sapiens arrived and finally also disappeared. 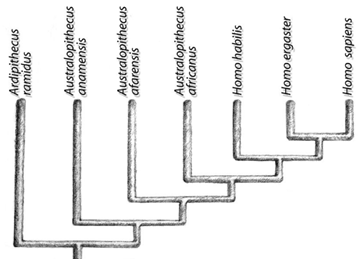 Homo Antecessor - The Great Dolime. The discoveries of Juan Luis Arsuaga, Eudald Carbonell, Ignacio Martinez and Jose Maria Bermudez de Castro in the Great Dolime (Spain) in 1997, allowed to speak of a new species: Homo Antecessor, which “precedes the other,” which he lived in Europe about 900,000 or 800,000 years ago. This species is not Homo Erectus, and probably would be close to Homo Ergaster, but not so. That is, Homo Antecessor would be “an evolutionary intermediate between Homo Ergaster and Homo Sapiens.” However, it was also found which was related to Neanderthals. His origins are probably Asiatic. 400,000 years ago a group of Homo Heidelbergensis lefts Africa and goes to Asia and Europe where evolves to Neanderthals. It is the species between Neanderthals and Homo Antecessor. The rest of Heidelbergensis which rested in Africa would evolve to Homo Sapiens. We know that Neanderthals lived in Europe from about 230,000 years ago. It was very cold-adapted species to the freezing cold of Europe. Neanderthals disappeared about 30,000 years ago with the arrival of Homo Sapiens but coexisted for some time. In the picture we can observe the temporal and geographical hominid populations distribution; it is a possible family tree of the genus Homo. 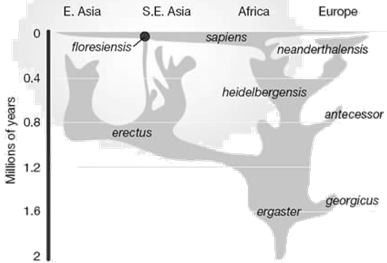 From Homo Ergaster in Africa, leaves two branches: The Asian (Homo Erectus) and the African -and European- (Heidelbergensis and Homo Antecessor), from this, derive the Neanderthal. Finally, from heidelbergensis emerge Homo Sapiens in Africa colonising rest of the world. All species disappeared except Sapiens.